In the evenings when we sit outside, we see bats swooping through the air. My daughter happily points out that they are “Stellalunas!” Granted, Stellaluna is about a fruit bat and we don’t have them here in Southern Nevada but I love that she has a positive impression of bats because of this book. It doesn’t hurt that the illustrations are gorgeous. 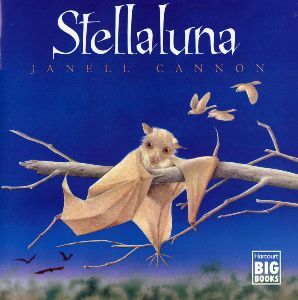 I have loved Stellaluna since I was in elementary school and it is a story of friendship but in re-reading the book for Vegbooks I think there is a tricky discussion point raised by the story. Stellaluna, a baby fruit bat not yet able to fly, and her mother are attacked by an owl one night and are separated from one another. In tiny sketches at the top of each page, you see Stellaluna’s mother searching for her in different places as the story unfolds. Meanwhile, Stellaluna finds herself in a nest of three baby birds, Pip, Flitter, and Flap. Stellaluna is hungry so she starts to eat the bugs that Mama Bird brings to feed her babies. When sleeping upside down causes the birds to mimic her, Mama Bird tells Stellaluna she must sleep standing up if she wants to remain there. “Stellaluna promised to behave as a good bird should. She ate bugs without making faces. She slept in the nest at night. And she didn’t hang by her feet.” This makes me a little sad because though Stellaluna develops a friendship with the baby birds she must eat bugs, sleep at night, and even fly during the day when the time comes for flying. She is later happily reunited with her mother and returns to the baby birds to tell them all about the other bats but the birds are unable to fly at night with Stellaluna. She saves them and the four friends agree that though they are so different and feel so different they feel and are alike at the same time. The ultimate idea of being friends across differences is a good one and I don’t think my daughter yet makes a connection with how Stellaluna must forsake so much of her natural ways to stay safe with the bird family, but it would be wise to preview the book and be aware of the issues and whether or not you’d like to share it with your child. On the flip side, my daughter has recently started asking (unrelated to this book) which of her friends eat animals and which don’t, for example, so the idea of being friends even though you don’t agree on everything is a good one. Cannon has other books, such as Verdi, if you prefer to steer clear of Stellaluna but with Halloween coming up this may be a fun choice.